Pros: Moves plenty of air at lower RPM`s. So is pretty quiet. Your sound level will vary by hardware and specific cooling needs. Do not expect any. Delta`s are quality fans. Other Thoughts: Adapted mine to the Dell proprietary 5 pin mobo CPU fan socket. Had up graded and old Optiplex from a Pent D 2.80 Hyper-threaded to a Pent 4 3.6 dual core. Needed the extra cooling to eliminate thermal shut down problems. No more lagging or shut downs from overheating. My setup has the fan feeing air to my 3 SLIed GTX 980's, keeps then super cool. Other Thoughts: Delta should make larger fans! Pros: Fan does its job very well. It keeps the computer cool and will never let you down. Cons: It's pretty loud. On start up, it went full power and was louder than my current vacuum. Other Thoughts: My computer, which only had a CPU fan and a front fan that took in air never had an exhaust. Now that I'm playing much more powerful games, my computer was complaining saying the temperature was over 65 degrees centigrade. This fan will always keep it around 50 degrees centigrade no matter what the circumstance. Cons: I wish it came with a controller...aware of the sound going in so not really an issue. Other Thoughts: I found a custom fan controller at overclockers.com fabricated by the member Bobnova. 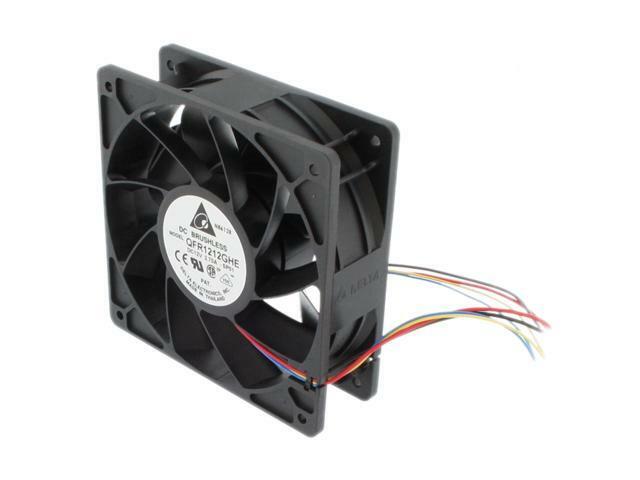 Controlling a PWM fan by voltage is a waste of power and fan. Bobnova's controller handles this fan's duty cycle from 0-100% to tame this beast of a fan (read: you control the noise). The controller completes this fan for a long life of service. Other Thoughts: I purchased 2 of these to use on my Cooler Master Eisberg 240L to run in push configure. I bought a pwm fan spiltter with a power connector directly to the PSU. I will probably never have them over 50 percent speed but Its nice to know I have some head room. Also these things will probably outlast every other component in my PC, very high build quality. It is confirmed that they can drowned out the yelling your lady is doing because you are making so much noise. Shut down on these seems to be at 2500 rpm, anything less and they shut off, but even at 2550 rpm they are still loud enough that i have to turn the volume on the TV up to 29 and the TV is 27 feet away, at full power there is no watching TV. Cons: It can get very load if you have at full speed, sounds like a vaccum , but dang does it get air!!! Other Thoughts: Can you handle the AIR FLOW? HELL YEAH , THIS FAN ROCKS!!! ITS WORTH EVERY PENNY BY FAR!! 1 FAN EQUALS TO 5-6 REGULAR FANS, This is a must buy fan if anyone is having air flow issues on there computer or home(lol) Its no joke, this fan can push some air like there's no tomorow, you will get all the air flow you have ever dream, ITS GREAT,, Dont worry about the price , thats is nothiing compare to what product your receiving, this is great and must have for those running crossfire set ups, or overclockers!! Pros: This fan moves fan like no computer fan I have ever encountered in my entire life. It is louder than two vacuum cleaners running. It is amazing. When I go to sleep at night, I do not hear my neighbors partying. I do not hear the random girls partying with my roommates, walking in and out of my room to use my restroom. Cons: This fan is so powerful, that it sucked the soul out of me and left me with ginger hairs. Other Thoughts: I WANT MORE!